We teach our students the sport of horseback riding while addressing their cognitive, emotional and physical needs by using the horse as a partner and a therapist. We keep our classes small to ensure individual attention and safety. Our horses and ponies are even-tempered, well-trained and have adapted to being handled and ridden by people of all ages and abilities. Our instruction is hands-on, and is individualized to cater to each students learning pace. 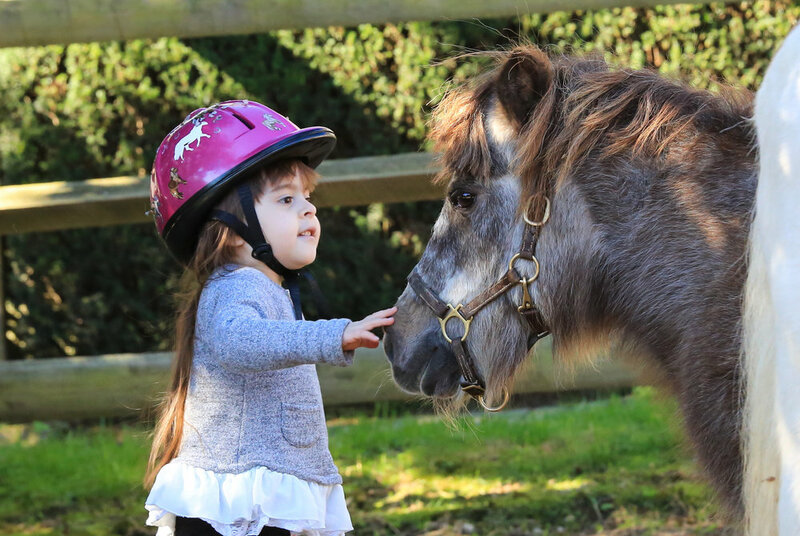 Our students are matched to our specially chosen, trained horses who are suited to their size, their abilities, and experience level; it isn’t unusual for the horse to become their trusted therapist, and more importantly, one of their best and most beloved friends. Our head instructor will work with the parent(s) or caretaker(s) of each student to design a specialized program for each child based on their individual needs, and short and long term goals. Equine assisted therapy can take many forms from riding, to ground work, to horsemanship, and everything in between. Therapeutic riding can benefit people of all ages both physically and cognitively. Each therapeutic lesson is taught by a qualified instructor and is assisted by as many specially trained volunteers as needed. We have access to a two large outdoor arenas as well as a grass hunt course. In addition, there are miles of trails so that our students can trail ride.